Three fantastic drives consecutively. The first one I was with a couple on board to Lake Tagalala for the boat excursion. Tagalala trip is always fantastic because there are three activities in one. Game drive to the lake, boat cruising on the lake and swimming in the hot springs. Our fabulous morning started at the quarry where we saw a pair of Giant Eagle owls perching on a tree. We don’t often we see these Owls and to see them together it was even better. Just after the Msine crossing we saw a band of Mongoose. As we were watching them all of a sudden they made an alarm call and shot in to the thickets. 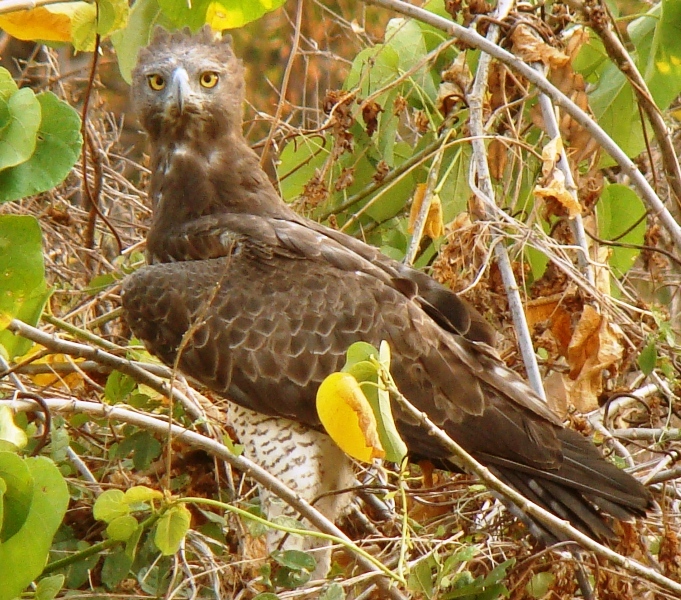 It was Martial eagle trying to hunt them. Luckily there were many thickets to hide. Then we saw a nice sized breeding herd of Buffalo, Wildebeest, Zebra, giraffe, Baboon, Waterbuck and Warthog. By the lake we saw a pride of six Lions including Musketeers, some Hippo and Crocodiles. The following day I took another couple to Lake Manze for the morning drive. We started our drive with a family of three elephants just before the battlefield and from there we saw so many Giraffe. We saw other plain games as well but it was like Giraffe morning. At the lake we saw a beautiful male kudu. We spent quite some time watching him. Then we saw a pride of five Lions including two adult lionesses and three sub adults. They looked full as if they had eaten the day before. As we were watching them a big mixed herd of Wildebeest, Impala and Giraffe were coming to drink. I didn’t expect for the pride to hunt but I just pulled my vehicle back so that Lions could see what was happening. We were on the best place to see a kill because between us and the herd were nice bushes where the Lions can hide. Two Lionesses started stalking using the bushes as hunting cover. I couldn’t manage to see where the animals were drinking but I didn’t want to move because I didn’t want to interfere. As I saw the herd quickly running back I rushed over there and we manage to see one Lioness holding young a Wildebeest trying to pull it down. 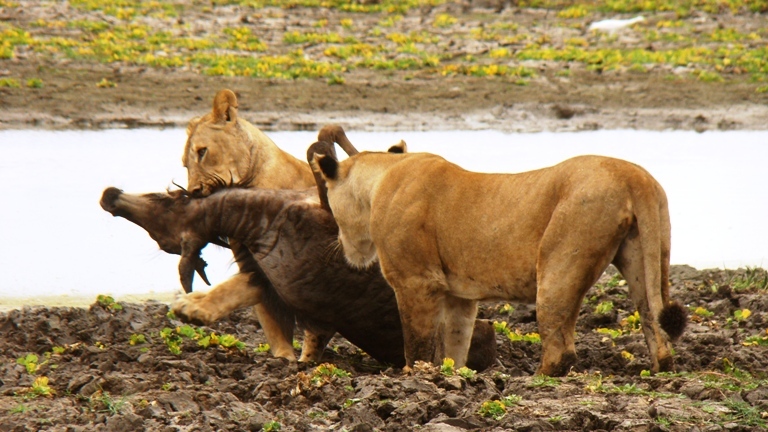 We watched a whole kill but the lion struggled to pull it out because the wildebeest was stuck in the mud. So the pride had to eat there. The last one was Lake Tagalala again with another couple. Just after Selous grave we saw a family of four elephants in the palm forest. They had a tiny baby. After the Msine crossing we saw a troop of Baboons playing on the riverbed. They seemed to be very happy because of the way they were jumping and playing it was fascinating to watch. We didn’t even finish watching them when I received a radio from one of our drivers that they have seen Wilddogs at Lake Tagalala. So excitedly we rushed there. Luckily we got there just in time. They were finishing eating a young Impala. We watched them for maybe five minutes before they disappeared into the bushes. We saw the Alpha female and she had big teats to show that she is lactating and I think where they were heading is where their den is, but it is inaccessible. 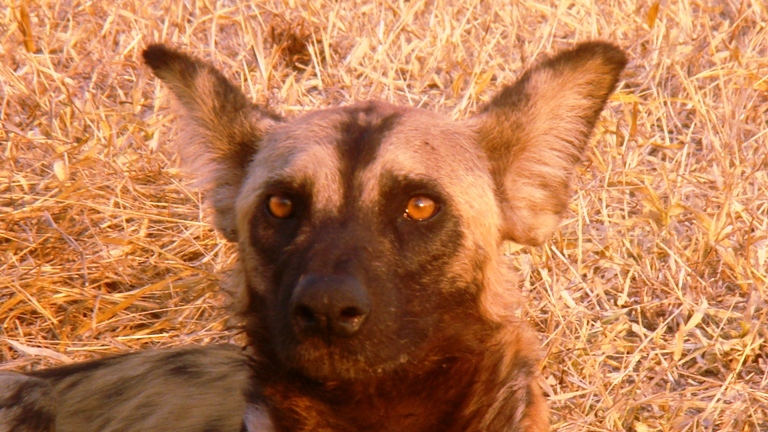 This entry was posted in Salum, Wildlife and tagged Beho Beho, camp, kill, lions, Martial Eagle, safari, selous, wild dogs. Bookmark the permalink. Wow, some great game drives, Salum!! Wish we were there!